Home » Blog » dental bridges » Partial Dentures or Bridges: Which Is Right For Me? In this day and age, if you have missing or damaged teeth, you have plenty of options to get your pearly whites back as good as new. Replacing your missing teeth isn’t only for cosmetic purposes. It’s also important for the proper alignment of your teeth. Even a single missing tooth and not having it replaced can result in wrinkly skin, a distorted chin and lips. Missing teeth can affect your remaining teeth and cause complications with your bite. Therefore, you must place importance on your dental hygiene and oral health by visiting your dentist to weigh your options regarding tooth replacement treatments. Some of the most common tooth replacement treatments are partial dentures and bridges. If the adjacent teeth are in poor shape and there is a chance they would have to be replaced in the future, partial dentures are the best option. A partial denture is made of plastic or a combination of plastic and metal. The plate is made in a way that it easily clips onto the surrounding teeth where the gap is. It is imperative you go to a practiced and experienced dentist. If the partial dentures are not made and fixed properly, there is a chance the partial denture will damage the healthy teeth. Many patients prefer partial dentures because they can easily be removed for cleaning. 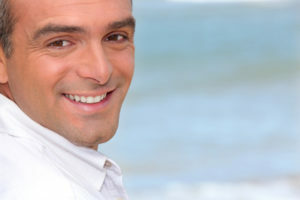 Most dental insurances cover for partial dentures. Partial dentures are more cost effective as compared to permanent bridges. Partial dentures are recommended for those patients who have a case of gum loss or gum disease. It is also an effective option for patients who have a history of smoking or who have certain health conditions. Most tooth replacement options last a good amount of time such as for 15 years and longer. In comparison, partial dentures last for about five years. This means that the patient will have to get their partial denture replaced more frequently as compared to a fixed bridge. Most patients find partial dentures to be less comfortable than other permanent replacements. A bridge comprises of artificial replacement teeth that your dentist cements to your teeth. The healthy teeth are used as anchors to support the bridge. The dentist will prep the adjacent teeth on both sides of the bridge, fill them down, and take an impression, which will be sent to the lab to form the bridge. Bridges will last longer as compared to partial dentures. With proper use, they will last for more than 15 years. Bridges give a more natural look and feel to the patients. The neighboring teeth have to be strong and healthy with no gum damage to hold the bridge. Your dentist will have to alter the shape of adjacent teeth and place a crown to help attach the bridge. Bridges are more expensive as compared to removable partial dentures. ← Young Kids and Cavities – What’s Normal?